Grupo Faborit has 18 establishments in Spain dedicated to coffee, tea, chocolate, and fruit and vegetable juices, along with healthy food (freshly prepared salads and sandwiches) under the premise of using 100% fresh and natural products, in a pleasant atmosphere with a modern design, providing wellbeing to clients. This is where PORCELANOSA Group plays a role with its compact mineral KRION®, an ecological material that can be recycled 100%, and which is easy to clean, highly resistant to chemical attack, durable, and has an additive-free antibacterial property. 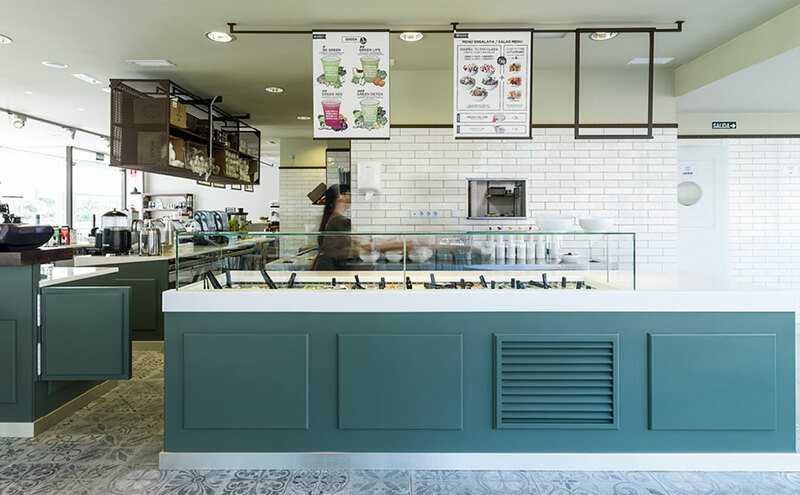 It is a perfect combination between the care and attention that Faborit restaurants take with their ingredients, and the social responsibility of the solid surface KRION®. In one of its latest openings, Faborit Alcobendas, in Calle Anabel Segura number 10, we can find KRION® in the different bars which run through the interior of the establishment in our 0101 White Nature colour. This provides increased warmth, which along with turquoise blue, the hydraulic mosaic and the brick covering, create an ideal atmosphere at any time of day. KRION® transformed by: Encidecor, S.L.